Anna's Flowers & Gift Shop provides the Eunice, LA area with the finest flowers and the sweetest gifts. Anna's Flowers & Gift Shop was opened with a passion for bringing beauty and happiness into the lives of the residents of Eunice, and we make it our mission to ensure our clients are not only happy with the flowers and items in our shop, but the personal service provided by our staff as well. We want you to leave our shop feeling bright and uplifted, and believe kindness can go a long way. If you are looking for a stunning floral arrangement or a simple but meaningful gift, we can help. 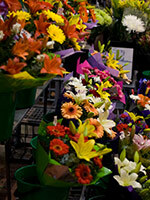 Come in to Anna's Flowers & Gift Shop today to see what we have to offer.